MODEL SPECIFICATIONS: Model size is listed by the outside diameter of the reel. Spool width describes the inside width of the spool. Reel weight is given in ounces without line installed. Model 3 ½”: Spool Width: 1 5/32.” Weight: 10 ounces Fly Line: 8,9 single hand rods, and 5,6,7 two handed rods and switch rods. Capacity: 150yds+ 20# micron 450gr Skagit Head +100ft/.035 shooting line Application: Extremely popular model designed for single hand salmon and steelhead rods in the 8 and 9 weight class. Also a perfect choice for lighter two handed rods in 5, 6 & 7 weights, and of course switch rods. Model 3 ¾”: Spool Width: 1 5/32.” Weight: 11.5 ounces. Fly line: 6,7,8 Capacity: 125+yds. 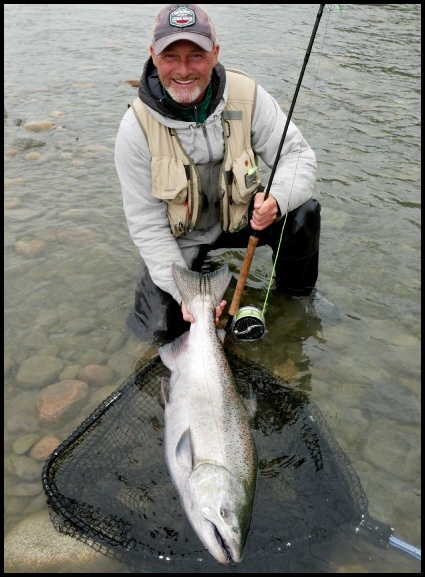 Application: The 3 ¾” is our most popular salmon and steelhead reel period! Anglers from all over the world have shown us that this is their reel of choice. We have trouble keeping this reel model in stock. The spool capacity accommodates some of the most popular line weights, and the reel balances well on the latest 12ft to 13 1/2ft rods. Model 4”: Spool Width: 1 5/32.” Weight: 12.0 ounces Fly line: 8,9,10 Capacity: 150+yards. Application: If you are going to own just one reel for all of your two handed rod fishing this is the reel. It comfortably balances most rods 13 ½ ft to 14 ½ ft long, that cast 7, 8, 9 & 10wt lines. Model 4 ¼”: Spool Width: 1 5/32.” Weight: 13.5 ounces. Fly Line: 9,10,11. Capacity: 225+ yards. Application: The 4 ¼” is designed specifically to balance two handed rods 14ft to 16ft in length, for 8/9/10 weight lines. This is a big rod, big line, big fish reel, designed for 2 handed rods. Model 3 1/4”: Spool Width: 1 5/32”. Weight 9 ounces. Fly Line: 6,7,8 for single hand rods and 5,6,7 Switch rods and 3,4,5,6 two handed spey rods. Capacity: 125yds 20# Rio Dacron backing with a Rio WF8F line or a Rio 5/6F Short Head Spey line and similar line types. 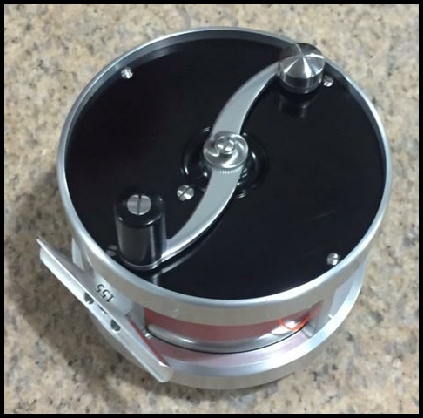 This is now our smallest disc drag reel designed for salmon and steelhead fishing. Super versatility since it perfectly matches single hand rods 9 ½ to 10 feet long in the 7 and 8 wt class. And with the addition of the 2-1 multiplier gear box it fits that classic single hand Atlantic Salmon rod outfit perfectly. It is an awesome reel for switch rods and modern light weight, light line spey rods gaining popularity. Our new MARK V Salmon reel is the latest refinement in the evolution of our MARK series reels. New is our totally sealed Carbon Fiber drag system. 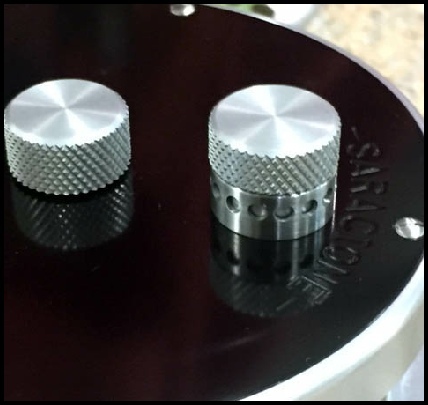 Our system incorporates two proprietary seals operating on the rotating shaft; a primary and secondary seal to ensure a truly sealed drag chamber. The spool rides on two sets of precision stainless steel radial ball bearings and two sets of precision stainless steel axial ball bearings for super smooth operation. 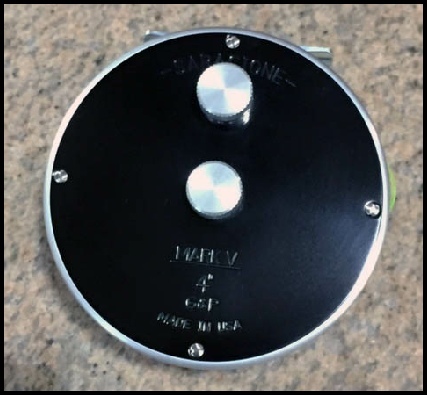 We incorporated a strong gear and pawl drag to help control spool overrun at low disc drag settings and to provide a loud audible click on both incoming and outgoing spool operation. Further design refinements resulted in a weight reduction of 20% as compared to its predecessor the MARK IV Salmon reel. 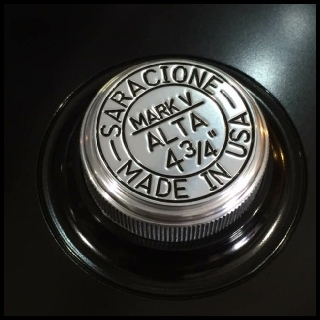 All MARK V reels feature a solid side plate and spool for a more classic look, and all models are anodized Silver and Black as our standard color combination. Finally we lubricate the MARK V with special oils and grease to operate trouble free in sub-freezing temperatures for extreme winter salmon and steelhead fishing. Production is limited and reels are available factory direct only. Model 4 3/4” ALTA: Spool Width: 1 5/32.” Weight: 16.5 ounces. Fly Line: 9,10,11. Capacity: 300+ yards. Application: The 4 3/4” ALTA is made specifically to balance two handed rods 16ft and longer, for 9,10,11 weight long belly Spey lines. 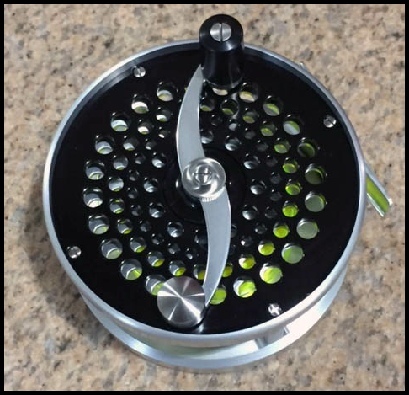 This reel was designed by the request of Norwegian anglers for use with their long Salmon rods used on big rivers for giant Atlantic Salmon. It has also become very popular with anglers fishing the larger rivers of Scotland. 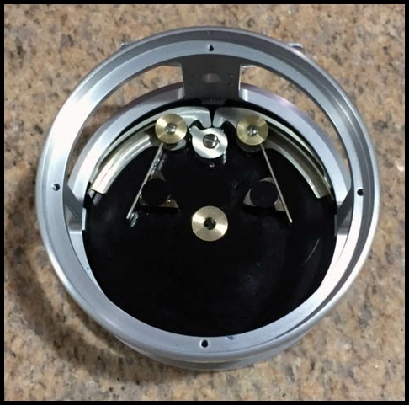 Model 4” G&P: (Gear & Pawl Drag System) Spool Width: 1 1/16.” Weight: 12.0 ounces Fly line: 6,7,8,9 Capacity: 180+yards. This is our new MARK V G&P reel. Requested by Pacific Northwest Steelhead anglers wanting a high performance gear & pawl drag system incorporated into our classic Mark V design. It comfortably balances most rods 12 ½ ft to 14 ½ ft long, that cast 6,7,8,9wt lines. This reel features oversized gear pawls and heavy springs. Converts easily Right-to-Left hand retrieve and vise-versa. This is a very loud reel, and the drag adjustment is very linear from off to full on. Drag knob features positive detent stops, and the oil cap has the same adjustable side-play feature as on our Mark IV trout reels; to keep the spool running true and smooth. And finally the front side-plate and spool are ventilated on all G&P models. 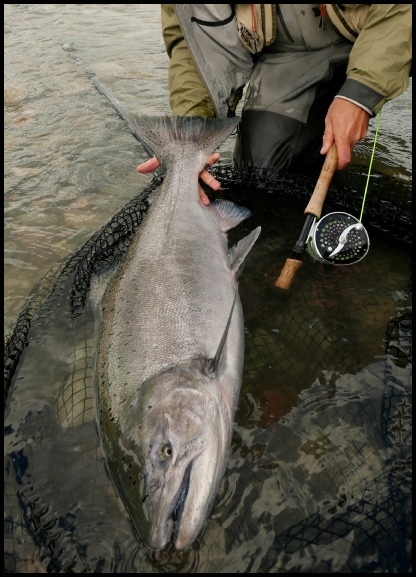 Steffen Juhl of Salmon Junkies was the first professional angler to put our G&P reels to the test. Here he is with a huge King Salmon caught in British Columbia Canada on his 4” G&P. It is now Steffen’s go-to-reel for all of his Spey type fishing. Model 4 1/4” G&P: (Gear & Pawl Drag System) Spool Width: 1 1/16.” Weight: 12.6 ounces Fly line: 8,9 & 10 Capacity: 225+yards. This is our latest MARK V G&P reel model. It comfortably balances most rods 14ft to 15ft long, that cast 8,9 & 10wt lines. 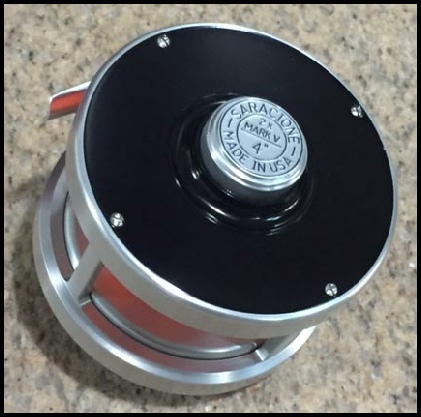 This reel features the same oversized gear pawls and heavy springs as our 4” G&P. More capacity, with bigger bark and bite than our 4” model and only 0.6 ounces heavier.